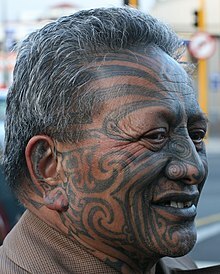 Tame Wairere Iti (born c. 1952) is a Tūhoe Māori activist in New Zealand. He grew up in the Urewera area, and in the late 1960s and 1970s he was involved in protests against the Vietnam War and apartheid in South Africa, and in many Māori protest actions. His ability to court controversy and his full tā moko make him well-recognised. With three others he was tried on charges of "illegal possession of firearms and participation in an organised criminal group" in 2012. The jury could not reach a verdict on the charge of belonging to a criminal group, but found all four guilty of firearms charges – and in May 2012, Iti was sentenced to jail for two-and-a-half years for these. He was granted parole in February 2013, and was released on 27 February 2013. Most associated with Tūhoe, Tame Iti also has links with the Waikato tribes of Ngāti Wairere and Ngāti Hauā, and with Te Arawa. Told he was born on a train near Rotorua, Iti was raised by his great granduncle and aunt, Hukarere and Te Peku Purewa, whom Iti calls his grandparents, in the custom known as whāngai (adoption within the same family) on a farm near Ruatoki in the Urewera area. The Purewas had also raised his father. He says that at the age of 10 his school headmaster (himself a Māori) forbade pupils to speak Māori at school. On leaving school, he took up an apprenticeship in painting and decorating after completing a year-long Maori Training Scheme at Christchurch Technical Institute in Christchurch. As the Māori nationalist movement grew in New Zealand in the late 1960s and 1970s, Iti became involved. He protested against the Vietnam War and apartheid in South Africa, and he became involved with Nga Tamatoa, a major Māori protest group of the 1970s, from its early days. He joined the Communist Party of New Zealand, and went to China in 1973 during the cultural revolution. He has taken part in a number of land occupations and held a hikoi to the New Zealand Parliament. Iti has worked as a radio DJ and artist. He was a partner in a restaurant on Auckland's Karangahape Road that served traditional Māori food. The alcohol-free restaurant, which incorporated an art gallery, opened in 1999 and closed within a year. He stood for Parliament as a candidate of Mana Māori in the 1996, 1999 and 2002 New Zealand general elections, and for the Māori Party in 2014. As of 2012[update] Iti has been employed by Tūhoe Hauora, a health service, for several years as a social worker dealing with drug and alcohol problems. He has three children, two of them adults. Tame Iti's ability to court controversy has made him a common feature in New Zealand news media. Iti has a full facial moko, which he described as "the face of the future" in New Zealand. During 2004 he wore a mohawk. The public arguably know Iti best for his moko and for performing whakapohane (baring his buttocks) at protests. On 16 January 2005 during a powhiri (greeting ceremony) which formed part of a Waitangi Tribunal hearing, Iti fired a shotgun into a New Zealand flag in close proximity to a large number of people, which he explained was an attempt to recreate the 1860s East Cape War: "We wanted them to feel the heat and smoke, and Tūhoe outrage and disgust at the way we have been treated for 200 years." The incident was filmed by television crews but initially ignored by police. The matter was however raised in parliament, one opposition MP asking "why Tame Iti can brandish a firearm and gloat about how he got away with threatening judges on the Waitangi Tribunal, without immediate arrest and prosecution". New Zealand Police subsequently charged Iti with discharging a firearm in a public place. His trial occurred in June 2006. Iti elected to give evidence in Te Reo, Māori (his first language), stating that he was following the Tūhoe custom of making noise with totara poles. Tūhoe rangatira stated Iti had been disciplined by the tribe and protocol clarified to say discharge of a weapon in anger was always inappropriate, but stated that it was appropriate when honouring dead warriors (in a manner culturally equivalent to the firing of a volley over a grave within Western cultures). Judge Chris McGuire said "It was designed to intimidate unnecessarily and shock. It was a stunt, it was unlawful." Judge McGuire convicted Iti on both charges and fined him. Iti attempted to sell the flag he shot on the TradeMe auction site to pay the fine and his legal costs, but the sale – a violation of proceeds of crime legislation – was withdrawn. It was later put up for sale again by politics blog Tumeke. Iti lodged an appeal in which his lawyer, Annette Sykes, argued that Crown Law did not stretch to the ceremonial area in front of a marae's wharenui. On 4 April 2007, the Court of Appeal of New Zealand overturned his convictions for unlawfully possessing a firearm. While recognising that events occurred in "a unique setting", the court did not agree with Sykes' submission about Crown law. However Justices Hammond, O'Regan and Wilson found that his prosecutors failed to prove beyond reasonable doubt that Iti's actions caused "requisite harm" under Section 51 of the Arms Act. The Court of Appeal described Iti's protest as "a foolhardy enterprise" and warned him not to attempt anything similar again. Iti figured among the at least 17 people arrested by police on 15 October 2007 in a series of raids under the Terrorism Suppression Act and the Firearms Act. In September 2011 most of the alleged terrorists originally arrested with Iti had all terrorism and firearms charges dropped. Iti and three others were charged with belonging to a criminal group. The trial was held in February and March 2012, and Iti and the other defendants were found guilty of some firearms charges, and not guilty of others. On the most substantial charge of belonging to a criminal group, the jury could not reach a verdict, even when invited by the judge to reach a majority verdict of ten to one. The Crown decided not to proceed with a second trial. Justice Rodney Hansen sentenced Iti and Rangi Kemara to a two-and-a-half-year prison term on 24 May 2012. In October 2012 Iti and the three others convicted on firearms charges following the raids lost an appeal against their sentences. Iti's son Wairere Iti said his father was "not overly surprised", and they may take the case to the Supreme Court. Iti was granted parole in February 2013. Iti was released from prison on the morning of 27 February 2013. Prison staff described him as a "role model prisoner". Iti said he enjoyed his time inside, working as a mechanic and working on his art and writing. Tame Iti performed a lead role in the Tempest dance theatre production by MAU, a New Zealand contemporary dance company directed by Samoan choreographer Lemi Ponifasio. The Tempest premiered in Vienna in June 2007. Tempest II was performed at the Queen Elizabeth Hall, Southbank Centre, London in June 2008. Because of Iti's arrest and court case over the 'terror-raids' Ponifasio had to convince the New Zealand High Court to allow the detained Maori activist to travel on the 2008 tour. Affidavits in support of MAU from international arts organisations had also been submitted as evidence to the High Court. Iti was eventually allowed to travel for the tour. Tempest:Without a Body made its New Zealand premier at the Auckland Festival in March 2009. In 2008, Tame Iti featured with his son Toikairakau (Toi) Iti in the New Zealand documentary Children of the Revolution (2008) which screened on Maori Television in April of the same year. Children of the Revolution is about the children of political activists in New Zealand and also featured anti-apartheid leader John Minto and his teenage son; Green Party Member of Parliament, Sue Bradford and her journalist daughter Katie Azania Bradford; Māori Party Member of Parliament, Hone Harawira and his wife Hilda Harawira with their daughter Te Whenua Harawira (organiser of the 2004 Seabed and Foreshore Land March) and musician and former political prisoner Tigilau Ness with his son, hip hop artist Che Fu. The documentary was directed by Makerita Urale and produced by Claudette Hauiti and Maori production company Front of the Box Productions. The documentary won Best Maori Language Programme at the New Zealand Qantas Television Awards (now called Qantas Film & Television Awards) in 2008. ^ "Urewera Four trial: Boys to be witnesses", 15 February 2012, The Dominion. ^ a b "'Urewera Four' pair jailed". stuff.co.nz. Retrieved 24 May 2012. ^ a b Gay, Edward (14 February 2013). "Tame Iti granted parole". The New Zealand Herald. ^ a b "Tame Iti leaves prison on parole". 3 News NZ. 27 February 2013. ^ a b "Tame Iti, the Ngai Tuhoe ambassador". ngaituhoe.com. Retrieved 25 March 2012. ^ a b c d e Masters, Catherine (28 May 2005). "Tame Iti – the face of Maori nationalism". The New Zealand Herald. Archived from the original on 23 February 2013. Retrieved 25 March 2012. ^ "Activist opens restaurant with Maori flavour". The Dominion. NZPA. 1 May 1999. ^ "Part III – Party Lists of unsuccessful Registered Parties" (PDF). Electoral Commission. Archived from the original (PDF) on 8 February 2013. Retrieved 14 June 2013. ^ Te Kāea (24 August 2014). "Tame Iti to stand as list candidate for Māori Party". Māori Television. Retrieved 15 February 2017. ^ Simon Collins (20 October 2007). "Tame Iti was on Government payroll". The New Zealand Herald. Archived from the original on 23 February 2013. Retrieved 25 March 2012. ^ Masters, Catherine (21 March 2012). "'Untrue' guerrilla claims go back to 1980s, says Iti". The New Zealand Herald. Retrieved 25 March 2012. ^ "Tame Iti shooting a flag, 2005". Te Ara. 23 May 2013. ^ "Iti may appeal guilty verdict". One News/RNZ. 30 June 2006. Retrieved 25 March 2012. ^ "Tumeke.Blogspot.Com Puts Iti Flag On Own Auction". Scoop.co.nz. 1 July 2006. ^ Hazelhurst, Sophie (4 April 2007). "Wrangle over firearm charges 'ridiculous' – Tame Iti". The New Zealand Herald. Auckland. Retrieved 1 July 2008. ^ "Tame Iti feels vindicated". Newstalk ZB. 4 April 2007. Archived from the original on 29 September 2007. Retrieved 1 July 2008. ^ "Nationwide anti-terrorism raids, 14 arrested". The New Zealand Herald. 15 October 2007. Retrieved 15 October 2007. ^ "NZ police hold 17 in terror raids". BBC. 15 October 2007. Retrieved 15 October 2007. ^ "Urewera verdict: Tame Iti guilty on six charges". 3 News NZ. 20 March 2012. ^ Gay, Edward (20 March 2012). "Urewera trial: Guilty of firearms charges, hung jury on conspiracy". The New Zealand Herald. Retrieved 20 March 2012. ^ Gay, Edward (8 May 2012). "'Urewera Four' will not be re-tried". The New Zealand Herald. Retrieved 19 June 2012. ^ "Iti's son 'not overly surprised' by appeal rejection". 3 News NZ. 30 October 2012. ^ "'Firearms part of my culture' – Tame Iti". 3 News NZ. 27 February 2013. ^ Scoop, The (4 May 2008). "High Court Allows Tame Iti To Travel To Europe | Scoop News". Scoop.co.nz. Retrieved 28 March 2017. ^ "Children of the Revolution". NZ On Screen. Retrieved 14 October 2009. ^ "Documentary – Children of the Revolution". Archived from the original on 27 June 2009. Retrieved 26 July 2009. This page was last edited on 17 December 2018, at 22:35 (UTC).